Companies that think outside the box, with global perspectives and sustainable principles, pioneering new directions, are trendsetters that shape the future. TEAM 7 is one of these. This solid wood furniture maker from Austria made a commitment to the "green path" a long time ago, and over the last few decades the company has given eco-friendly furniture a complete facelift. Extraordinary creations in solid wood, at the imm Cologne 2019. In these times of digitalisation, high tech and global networking, there is a growing need for oases of calm. Our homes in particular should be a place where we feel able to slow down. Natural materials create a rich sensory aesthetic. TEAM 7 at Living Kitchen in Cologne. Cooking with freshly harvested, healthy and delicious organic ingredients is very much in trend. TEAM 7 kitchens are created with similar values. 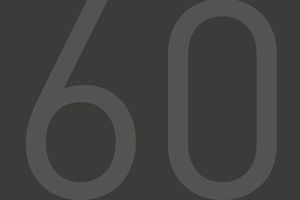 The Austrian furniture maker combines artisan craftsmanship with timelessly elegant design, sophisticated technology and sustainable principles. The entry hall as the “calling card of the living space”. An often overlooked but actually essential room in every house and apartment is the entry hall. It is the first thing that you notice when you come home. It should feel inviting and cosy while also offering storage space for shoes, jackets, coats and umbrellas. That's why the right furnishings are so important. An inviting reception space combines the beautiful with the practical. At TEAM 7, this combination is particularly valued. By using solid wood, the room appears inviting and warm; at the same time it reveals a sophisticated functionality that can be customised for each individual space. TEAM 7: World champion in entertainment furniture! Great events cast their glow ahead of themselves: soccer fans are already in a World Cup fever and this summer many households are totally wrapped up in the viewing. While the TV is running in full swing, the living room is clearly gaining ground as the most popular living space during the Football World Championship in Russia. Guests are coming, the family is waving flags and together the fans root for their favourite teams in front of the screen. These events are even more appealing if the furnishings also play along with perfect entertainment features. The cosy feeling of home begins when we step through the door. Entry hall furnishings by TEAM 7 ensure just that through their impressive range of components which perfectly suit all personal needs. Top-quality natural wood bestows the entry area with an inviting first impression, not least because of its many functional elements. Well thought out down to the smallest details, cubus entry hall furniture always provides the perfect solution for every taste. Floating to Sleep – The riletto Bed. The riletto bed by TEAM 7 guarantees perfect relaxation. Its recessed slides make the bedstead seem to float in the room while its fine proportions provide it with a stylish optical lightness, despite its size. The riletto bed easily adapts to individual customer requirements. It is flexibly extensible with a padded or wooden headboard as well as matching consoles and nightstands that grant extra storage and surface areas. Waldkante wall panelling – Living in Nature. TEAM 7 loves wood and innovative designs. The wall panelling Waldkante ('Forest Edge') by TEAM 7 makes it possible to live in nature. Manufactured from top-quality, untreated, natural oak, alder or walnut wood it makes for an exceptional, innovative look harmoniously corresponding to other timbers of the furniture or creating a captivating contrast with glass, stone and metal surfaces. Proper Care for Natural Stone Surfaces. Granite, marble, slate - stone is a product made by nature. Surfaces made from natural stone appear to be robust. However, they need regular care in order to preserve their high-quality look for a long period of time. All marble surfaces by TEAM 7 receive a base impregnation at the factory that prevents dirt from entering the stone where it can form permanent residues. filigno: Bridging the gap with delicate refinement. A delicate lightness characterises TEAM 7’s seamless connection between the dining and kitchen areas, which they will be presenting at the imm cologne 2017: filigno is the name of the new range, with elegant, sleekly designed solid wood sideboards and highboards that reflect their formal counterpart in the kitchen of the same name. TEAM 7-Double-prized: iF DESIGN AWARD 2017. This year, two products of wood furniture specialist TEAM 7 are awarded the renowned iF Design Award. Both desk tak and secretary sol won over the jury, which consisted of 58 members. The two models from now on can proudly carry the treasured seal of quality. The pioneer of sustainable wood furniture once more proved that at TEAM 7, nature, design, and innovative technologies belong together. TEAM 7 at the imm cologne 2017. Always focusing on the bigger picture, and always ready to take the next step – TEAM 7 builds on its role as a leading provider of unique solid wood design furniture. In Cologne, the Austrian manufacturer will introduce its new products for all living areas, with a fine feeling for sustainable materials: Moka oak – their new dark wood, natural leather, and ceramics extend the range of design options and sensory enjoyment. Developments in the design and function of its dining tables, almost unlimited possibilities for shelving and home entertainment systems, a new floating bed, and the introduction of a delicately composed new kitchen range with matching furniture for the living area, all emphasise the innovative energy which TEAM 7 is bringing to the imm cologne 2017. TEAM 7 at LivingKitchen 2017. 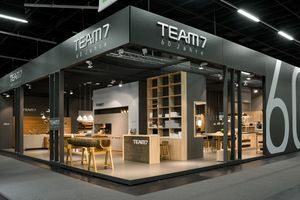 TEAM 7’s solid wood kitchens are always in good company: this Austrian manufacturer builds bridges between living areas and will be presenting complete furnishing solutions at LivingKitchen with a flair for colour, shape, and sustainable materials. It is all about love of wood and the perfect interplay between nature, design, and technology. This is how TEAM 7 has built on its position as a market leader in solid wood furniture to become an international benchmark for quality. Kitchens you can live in. The modern kitchen has changed. It no longer hides behind a door out of sight – it has instead become a part of the living area, offering a fluid transition between dining and living room. This development has been encouraged by increasingly open architectural spaces and designs. Kitchen enthusiasts now plan their entire apartment around this enjoyable space, as the kitchen has long ago established itself as the heart of the home. The magic cube of interior design: “cubus” – natural individuality. Wall unit, standalone furniture, or room divider? Stylish display case, versatile shelf unit, or smart desk? If you value flexibility in your furniture, welcome change, and have your own unique ideas, you will be well served by TEAM 7 and its high-level interior design. This applies to individually planned wall units, as well as to sideboards, tables, wall cabinets, and standalone furniture. 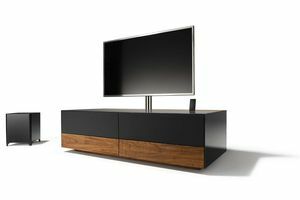 Because the Austrian solid wood specialist covers the full range of furniture with elegant simplicity. Wood kitchens: trends and tips for design and maintenance. Wood kitchens are right on trend. Because wood brings cosiness into your kitchen, making it especially suited to an openplan room design. Perfectly coordinated cooking, dining, and living areas flow into each other, creating a generous living space in which the kitchen is the heart of the home. Sebastian Desch, head designer at TEAM 7, offers practical advice on the advantages of a wood kitchen and how one should take care of it. Modern Living Comfort Meets Design. The linee kitchen “black line” by TEAM 7 certainly cuts an impressive figure. Cubic forms, generous black coloured glass fronts and clear lines give the new linee kitchen design its exceptional elegance. “black line” embodies the perfect symbiosis of inviting, harmonious solid wood, vibrant coloured glass and bold metal. A sense of cool elegance is provided by the range of handles, stainless steel plinth panels, work tops and coloured glass sides in matte black. Wooden joints – traditional craftsmanship meets modern technology. These joints will last for a lifetime: where heavy furniture parts come together, where supports are needed, or where board surfaces are joined and merged together into one unit, these classic wooden joints are brought to bear in every sense of the word. Tongue and groove joints, tooth joints, pins, and scarf joints don’t just score highly when it comes to aesthetic appeal, they also impress with their exceptional stability. TEAM 7 is specialised in working with high-quality wood. Healthier sleep in metal-free beds. People recharge their batteries when they sleep and get the energy they need for a fresh start to the next day. A night‘s rest determines our rhythm, health, ability to perform and even how good we look! No wonder that we spend around a third of our lives asleep. In actual fact the reality is somewhat different. Around 30 per cent of people suffer from sleep disorders and would be very happy to be able to sleep through the night and wake up feeling rested. The right bed can play a role in ensuring healthier sleep. And the body will reward you with good health. TEAM 7 is awarded the GOLDEN Pegasus prize. largest business award in the state of Upper Austria, founded by the Oberösterreichische Nachrichten newspaper and the Raiffeisen Landesbank Oberösterreich, is presented annually to the most successful businesses in the region. Well-designed solutions by TEAM 7. Whether you’re at home, in your office or at the office when at home, one thing is clear: home office solutions should be comfortable and functional at the same time. The solid wood furniture from the Austrian manufacturer TEAM 7 meets these requirements perfectly. The eco-pioneer offers stylish and practical furniture for the home office. The furniture is made from fine solid wood and thereby blends harmoniously into the living environment. When the wood is treated only with natural oil it remains porous and breathable, thereby ensuring a comfortable room climate.